I’ve always found the idea of an apprentice palatable. The idea of learning directly from a ‘master’ on real-world projects is, to me, a better way of doing things. Over my years in university I can’t count how many lazy students (including the lazy student in the mirror) I’ve met who slack off simply because they can’t feel the real world gravity of what they’re working on. 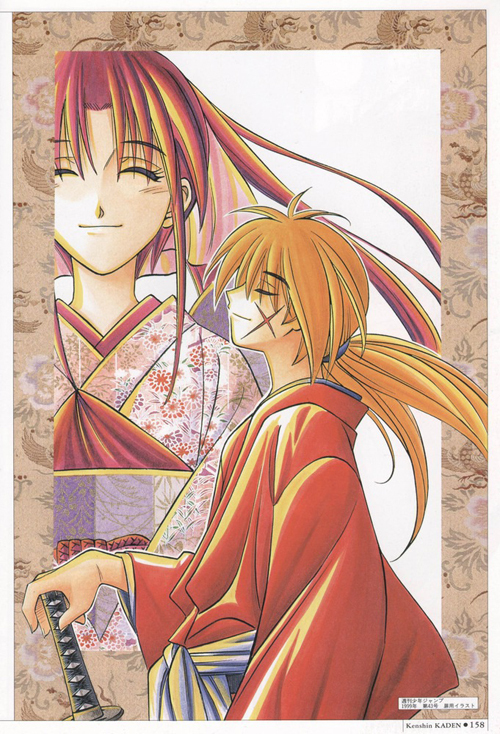 Just about every shounen mangaka has spent time as an apprentice: Eiichiro Oda (One Piece) began as Watsuki Noburhiro’s (Rurouni Kenshin, most notably) assistant, alongside Hiroyuki Takei (Shaman King). In turn, Nobuhiro (among others) were mentored by Takeshi Obata, of Death Note and Hikaru no Go fame. Naruto‘s Masahi Kishimoto claims to have been struck with an inescapable motivation to become a mangaka after seeing an Akira poster (penned by Katsuhiro Otomo), and all of these, including Hiro Mashima of Fairy Tail fame, are spiritual successors to Osamu Tezuka and Akira Toriyama. And where, you ask, is this lengthy preamble taking us? Towards Yankee-kun to Megane-chan! I have a small love affair with Yankee-kun to Megane-chan. 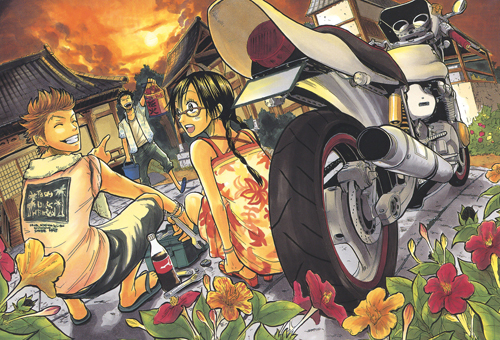 The series (whose title translates as “Gangster boy and Glasses girl” roughly) as a simple premise of a nerdy smart girl befriending a gangster bad boy, which its mangaka, Miki Yoshikawa, as the manga progresses, turns on its head. The smart girl, Hana Adachi, turns out to be pretty stupid, and has been held back a year. The bad boy, Shinagawa Daichi, is actually a nice guy, and fairly brainy. It’s a cute, plucky shounen manga which marks Miki Yoshikawa’s first time in the lime light. However, she’s spent a fair bit of time behind the scenes! Before Yankee-kun to Megane-chan, Yoshikawa was staff to Hiro Mashima, creator of Fairy Tail and Groove Adventure Rave. It’s easy to trace the line between the two: Yoshikawa follows neatly in Mashima’s footsteps in terms of art, often using surreal and camera-like perspectives coupled with thin, but anatomical and sculpted characters. There’s a lightness to her drawing that anyone who’s read Mashima’s work will find familiar. While this may be detrimental to her as an emerging mangaka (it’s easy to mistake her work for Mashima’s, or even Eiichiro Oda’s work) there’s something innately understood by mangaka, it seems: to become a master takes time, and the best kind of learning is by doing. 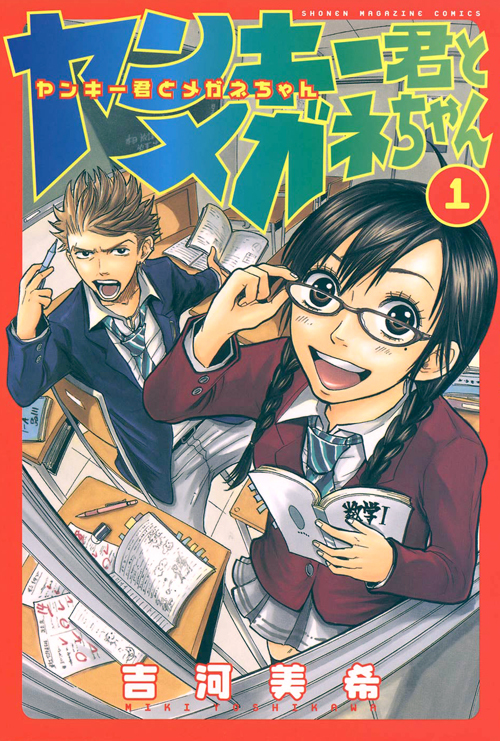 This isn’t to say that Yohsikawa’s work is simply a pale imitation of Mashima’s: Yankee-kun to Megane-chan takes place in the stereotypical high school setting, with its main characters, the Shinagawa and Adachi eventually rise to hold positions on the Student Council. The setting and general tone proceed with a girliness distinct from Mashima, though his calling cards are present – whilst the manga is at its heart a story about high school, it has an oddly-fitting action element to it. One wonders what Yoshikawa will produce after Yankee-kun to Megane-chan, and how she will evolve as a creator as she drifts further from her role as an apprentice, and into the role of a master. Apprenticeship, eh…? That’d be kinda cool, and definitely an effective way to learn. A personal connection with your teacher must have a certain motivating effect. You always learn better when you like and/or admire your teacher. Also, when the teacher actually pays attention to you, instead of apathetically lecturing to a full class of students he hardly knows, it’s obvious that the results are better. I think the real advantage to an apprenticeship would be the hands-on learning aspect, but definitely the other benefits you suggest apply. Not being familiar with Yankee-kun to Megane-chan, which does sound fun, I’d assumed this post would be about the characters in manga who serve primarily as the tutee of some important figure. Maybe all those important old sensei characters are based on stern mangaka who had improbable life-or-death training regimes for their apprentices. Hehehe 🙂 Perhaps. But I also tend to think (in perhaps my misguided foreigner way) that Japanese society has the idea of master-apprentice relationships deeply embedded – the idea of ‘senpai’s, etc. Great article. I love some good analysis of the influences that one manga artist can have on another while showing how the student then creates their own style as time goes on. And there are not enough people talking about Yankee-kun to Megane-chan so that is an extra bonus. One major flaw with the article that could make this article perfect. Some Rave Master (or any other Hiro Mashima manga) art. A good side by side comparison of a Hiro Mashima wild take and a Miki Yoshikawa wild take would reenforce what you are talking about one thousandfold. As they say a picture is worth a thousand words.